Beaches of the Philippines. Opens in a new window. 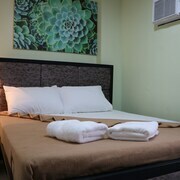 Clean room & fast check in process..
Where to find Mandaluyong hotels near an airport? 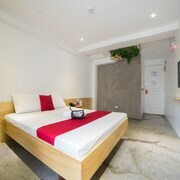 How can I find hotels in different Mandaluyong neighborhoods? Where can I find hotels in Mandaluyong that are near tourist attractions? 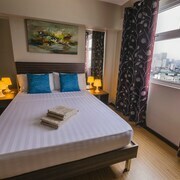 Hotel and apartment options are many and varied in Mandaluyong. Expedia's up-to-the-minute database has 364 places to base yourself that are within a 0.1-kilometre (0.06-mile) radius of the heart of Mandaluyong. 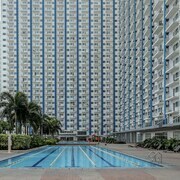 The Rio Suites, is an ever-popular choice for visitors as it the most centrally situated hotel choice in Mandaluyong. 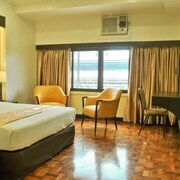 Economical accommodation options in and around the Mandaluyong region include the The Legend Villas, Lancaster Hotel Manila and New Horizon Hotel. 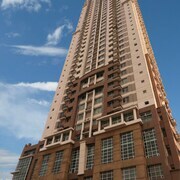 4 kilometres (2 miles) away from the main part of Mandaluyong, is the Raffles Makati. The Makati Shangri-la Hotel, Manila is positioned 4 kilometres (2 miles) away. Alternatively, investigate the Maxims Tower or the Vivere Hotel. After you've seen Mandaluyong, you should make time to investigate the other natural and cultural attractions of the Luzon area. Luzon is known for rural landscapes, beaches, forests and rainforest, and common Luzon attractions include traditional villages. Tourists in this section of Philippines can enjoy rock climbing, mountain climbing and hiking. Makati is 3 kilometres (2 miles) to the south of Mandaluyong and is where you'll find Ayala Center and Alliance Francaise. If you'd like to spend a few nights in Makati, check out the room rates at the Ascott Makati and The Peninsula Manila. Or, you could stay in Alabang, 19 kilometres (12 miles) to the south of Mandaluyong, where you can pick from the The Bellevue Manila and Parque Espana Residence Hotel. If you're staying in Alabang, set aside some time to visit the Baliton Beach and LazerXtreme. If sport is what you love, make sure you visit Smart Araneta Coliseum, which is 4 kilometres (3 miles) to the north of Mandaluyong. Those wanting to stay nearby can choose from the Edsa Shangri-La, Manila or the Oakwood Premier Joy-Nostalg Center Manila. If you are flying into or out of Ninoy Aquino International Airport and are looking to stay nearby try Manila Marriott Hotel or Fairmont Makati, Manila. What are the most popular Mandaluyong hotels? 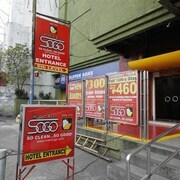 Are there hotels in other cities near Mandaluyong? 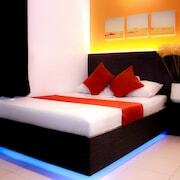 What other types of accommodations are available in Mandaluyong? Explore Mandaluyong with Expedia.ca’s Travel Guides to find the best flights, cars, holiday packages and more!